When I say that ‘god does not exist’ I mean to say that a sentence in which god (whether meaning the Absolute, the Wholly Other, the Infinite, the Supreme Being) is the subject and an action verb is the predicate does not describe an event or happening that occurs in our time or history, neither does it describe any objective reality. An intellectual movement known as Death of God Theology has been widely discussed but not very well understood since it first came to public attention in the post-war era more than 50 years ago. The “death of god” was not a new idea in the 1950s. It originated in the writings of the 19th Century German philosopher Friederich Nietsche but what made it a topic of considerable public interest in recent times was that it was being said by a small group of avant garde Christian theologians who initiated this trendy movement in theological seminaries and religion departments of several universities in the 1960s. One of the leading thinkers in this movement was William H. Hamilton, Professor of Theology at Colgate Rochester Divinity School in the 1960s, under whom I studied for several years and whose books and other writings were always interesting, provocative, thoughtful, creative, influential and controversial. I liked his style and I was intrigued and excited by his ideas. His teaching and writing have had a larger influence on my thinking than any other single source, and yet after having read and re-read everything he has written several times in the more than 40 years since my graduate theological school days, I still do not fully understand his thinking on a number of critical issues. This may be due to some limitation in my comprehension rather than to some obtuse quality in his writing. The fact remains that he was and has continued to be a very strong influence on my thinking about the meaning and implications of our use of the concept of god. This is not a discourse about theology or theologians, so I will not say very much about ‘death of God theology’ except to make a few observations about it. First, it was not a particular set of beliefs held in common by those who talked about the death of God in our time; it was rather a common phrase and theme by a number of different thinkers who seemed to have one foot inside Christianity and another foot firmly planted in the secular modern world but whose beliefs and interests were actually very different from each other. Second, in some sense all the proponents of ‘death of God theology’ owed some of their thinking to a small published volume of letters written from a Nazi prison camp by Dietrich Bonhoeffer, a Lutheran minister who was part of the Christian underground in Germany during World War 2 and who became involved in a plot to assassinate Hitler. Bonhoeffer was arrested, tried and ultimately hanged in April 1945 a few days before his prison camp was liberated. He wrote of a world in despair where god seemingly was absent and where we needed to learn to get along without Him. Third, it was not at all clear to me what they meant when they said ‘God is dead’ and at different times in different writings that odd phrase seemed to mean different things to each of them. At its most basic level ‘god is dead’ means that we as modern persons live in a secular rather than a religious world, the teachings of the Church no longer have the power to convince or persuade us, we have lost interest in religious ideas, or we no longer feel the need to use ‘god’ as an explanation for what we do not know or understand. It is not so much that we do not ‘believe in’ god or are hostile to religion so much as it is that we are no longer very much interested in religion and don’t think about it much or take it very seriously. In short, the ‘death of god’ means that for many of us god has ceased to exist as a meaningful part of our lives and our vocabulary and has become irrelevant to our understanding of ourselves or our world. It is as if god had died, we missed him and were sorry that he was gone, but now we must learn to get on with our lives without him. It was not hostility to religion or rejection of religious belief so much as it was a sadness that god was not available to us, something like the loss of a friend that we missed but could not bring back and had to learn to get along without. It means turning away from religion and toward the secular world not with joy or the sense of ‘good riddance’ but with sadness and reluctantly. I have no quarrel with theologians that take that view, if that is what they mean. It describes my viewpoint with reasonable accuracy. 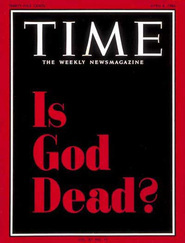 However some users of the phrase ‘god is dead’ seem to be saying something else, that in some sense they meant that god is dead quite literally, that he used to be alive but he has died, that the meaning of the Incarnation is that god gave up his ‘godness’ and became a man living among us, that with the death of Jesus god willingly, willfully, literally and actually died, that he is not available to us any longer as god, that what it means to be a Christian in our time is that we must learn to get along without God, that we are left with Jesus as our model and point of reference, that we are to seek Jesus in our neighbor, that if we look for him there with openness and compassion we will find him, and that we in turn are to become Jesus to our neighbor. It has a certain curious appeal to it and parts of it may reflect some ideas that have a legitimate place in Christian thinking, but in the end it seems to me both odd and unpersuasive and I have a hard time making sense of it or taking it seriously.